Ah, Austin. Home of delicious BBQ, tall boys of Lone Star and one of the biggest music, film and interactive conferences on the planet - South by Southwest. This year, we're heading back and we've got some exciting events happening around our presence. We're going to be manning a booth at SXSW:Create, which is FREE and open to the public! It takes place from Friday, March 13th until Sunday, March 15th and runs 11 a.m. to 6 p.m. on those days. If you want to attend, you'll need a Guest Pass, which you can learn about here. Folks who come to your booth will have the opportunity to solder together a Badger of their own. 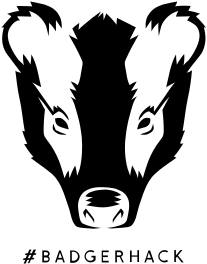 Using this interactive badge (or Badger! ), you can visit other booths around Create where we've placed reprogramming stations that we built. 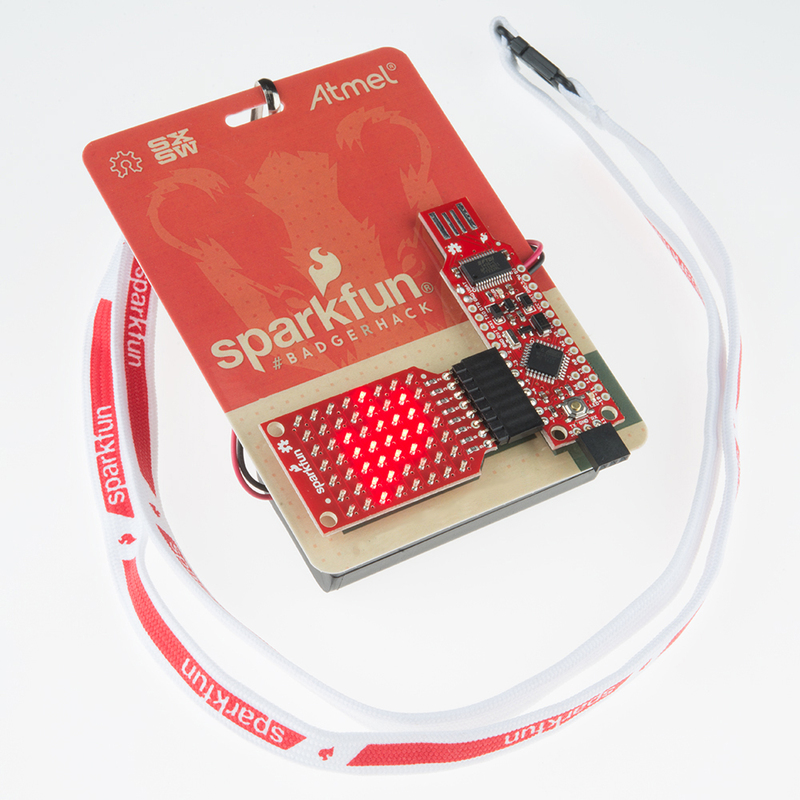 Visit the booths, reprogram your Badger and you'll win a SparkFun prize (as if the free Badger wasn't enough)! 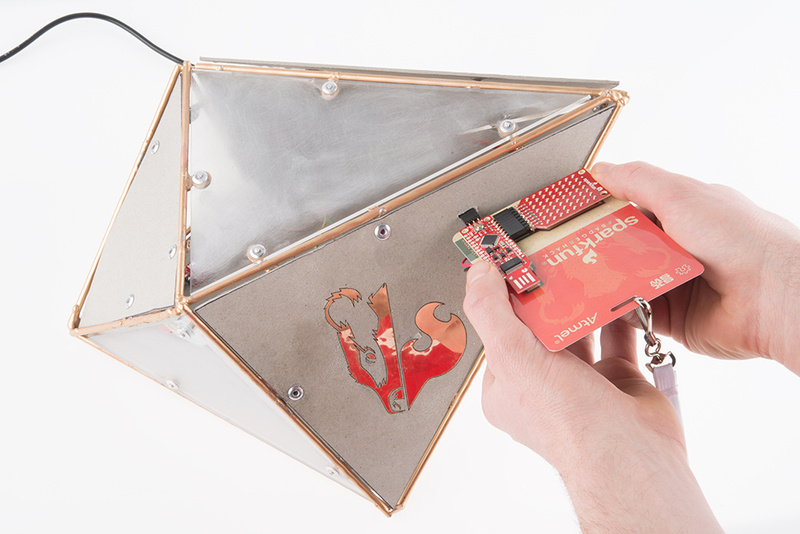 The Badger is also hackable, and we'll give you the resources you need to reprogram it on your own, use it to play games, scroll dirty words and much more! At our booth, we're also going to have an awesome installation called the "Paint with Code" wall. This wall is an installation designed to give players the experience of creating code-based visual art without having to know a programming language. Players can choose a (pre-written) block of code by picking up the associated controller and painting with it. The controller is shaped like a spray-paint can and tracked using cameras to give the effect of "painting" on the projection screen. Instead of "painting" a solid color, the controller paints a pattern generated from the selected code snippet. We don't have any images of this yet, but it's going to be epic. Finally for SXSW:Create, our CEO Nate Seidle is participating in a panel discussion on "Making to Manufacturing." This will take place on Friday, March 13th from 3:30 - 4:30 p.m. at the West Pincer Lounge in the Long Center. In addition to these Create goings-on, a couple SparkFunions will be giving presentations as part of SXSW:Interactive. These talks are not free -- you'll need a SXSW pass to get in. Why Patents Are Killing Innovation - by Nate Seidle. Sunday, March 15th, 12:30 p.m. - 12:45 p.m. in Ballroom C of the Austin Convention Center. Can Fandoms Fix Tech's Gender Gap? - by Jessica McDonald (SparkFun Director of Marketing). Sunday, March 15th, 11 a.m. - 12 p.m. in room 6AB of the Austin Convention Center. Wow, so yeah - it's going to be a busy few days. If you are coming to SXSW, we would love for you to stop by our booth, participate in the #BadgerHack, attend our talks, and talk shop! We hope to see you there! If you can't come, feel free to join in on the conversation on our Twitter page or search for #BadgerHack, where we'll hopefully be talking about all the fun stuff going on! Hopefully the weather is better this year. I remember last year it was cold and rainy. The badger looks so cool! Are you going to post parts lists and code so that I could make my own (as a trip to Austin TX is not really feasible)? Man I can't wait to visit the Sparkfun booth this weekend. :-) I'm really glad I live in Austin and will be able to go to the SXCreate event. I used to make simple electronics when I was a kid and have really started getting back into it since I needed a hobby as an adult. I am very glad to have a resource like Sparkfun to acquire parts and components because even places like Frys aren't carrying as much of the individual components anymore. ...but we'll have something going on for Pi Day. Stay tuned. Off-topic: I'm really surprised Sparkfun hasn't done a post-net-neutrality post yet! On that topic, we're not quite out of the woods yet considering the anti-net-neutrality stuff going on in Congress right now. It's possible we'll have something on this down the line, but right now IT is insanely busy.